When I first met Landon I knew that I wanted to work with her on so many levels!! Her work is amazing, and I loved all of the pieces it was so hard to choose just one piece. The pieces are affordable and absolutely stunning. I don't wear bracelets often so I knew I wanted to choose a bracelet. I love that her bracelets are so minimalistic, since I personally don't like a lot of stuff on my wrists. I almost picked this one and I love this one for everyday! Needing some last holiday gifts? 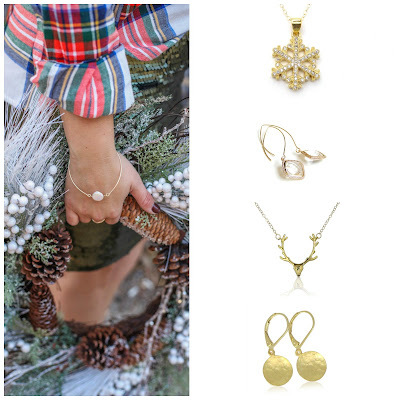 I've rounded up my 4 favorite pieces and remember today is the last day to order for guaranteed delivery by Christmas!! Wishing you a fabulous week! && Good Luck if you still have some last minute gift buying! This post is in partnership with Landon Lacey. All thoughts, writing & styling are my own. The jewellery pieces look stunning! I've never been a big fan of jewellery but lately I've been trying to build a collection because I realised they really add a little something to an outfit. And I like minimalist pieces too, they go with everything and never look "too much". You know I have to agree with you! I love the simple classic pieces they go with everything and aren't fussy. I do have the over top ones too and those are great to have when you want to be extra! omg how awesome are those pieces? ANd I LOVE teh plaid + shimmer. #perfection! that's a really cute holiday outfit! I thought so too! I knew they would make great gifts! I hope you snagged some! loved all combo :D you look awesome! Thank you so much!!! Hope you had an amazing holiday!